4-door sedan, so for us to have solely judged this book, the Kia Soul !, by its cover would have meant missing out on a surprising experience because this is one subcompact car that is big on surprises! Our Kia adventure began in Orlando, and the following are just three (3) of my surprising observations. We landed in Orlando and headed straight to the valet at the Hyatt Regency to pick up our car. The Kia Soul ! immediately stood out to me; and it did so for these two reasons. nice! So nice that we received several compliments wherever we went. Secondly, and most importantly, the Kia Soul ! had enough space to not only fit the four of us comfortably, but also fit all of our luggage. Surprise again! 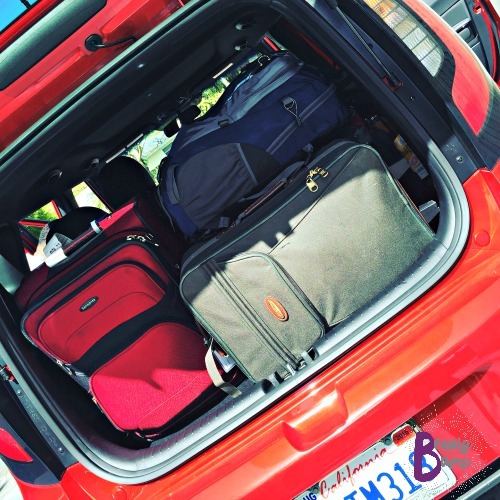 Trunk space and fitting our three suitcases, an oversized travel bookbag, plus a stroller was a major concern of ours – ‘how’s it all gonna fit?‘- but the Kia Soul delivered. Our luggage fit and so did we. great deal of roominess. I drove and my husband rode shotgun. He also sat in the backseat once or twice. Legroom is a must for him and he never had a bad word to say about sitting up front or sitting in the back seat. My mother and my daughter shared the back seat mostly and there was enough room for the two (2) of them, their bags, and all the tidbits junk they accumulated during our trip. Surprise #2: The Whole Shabang! Of course, SiriusXM, radio… We immediately punched in Channel 48 Heart & Soul as our number 1 preset. Now take a wild guess about preset #2. What do you think it was? Go ahead. 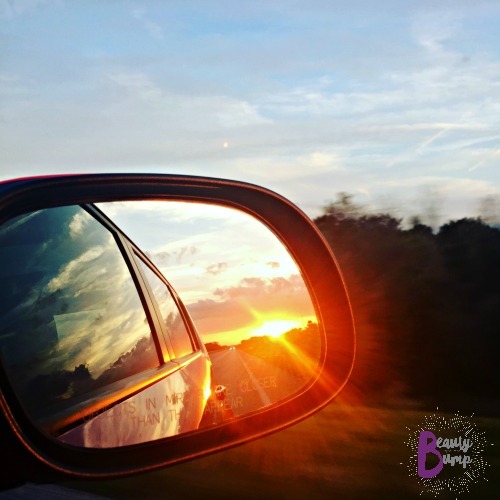 Take a moment… Channel 77 KidzBop Radio. Mini Me has to hear her tunes too. Some of our road tripping in Florida spanned 3 hours at a time. Mini Me singing along to KidzBop is one way we kept her settled and happy, and thus, kept ourselves settled and happy too. Satellite radio is a must, a requisite, a gotta-have-it! Infinity® Premium Audio & Voice-Command Navigation with an 8 inch Screen. 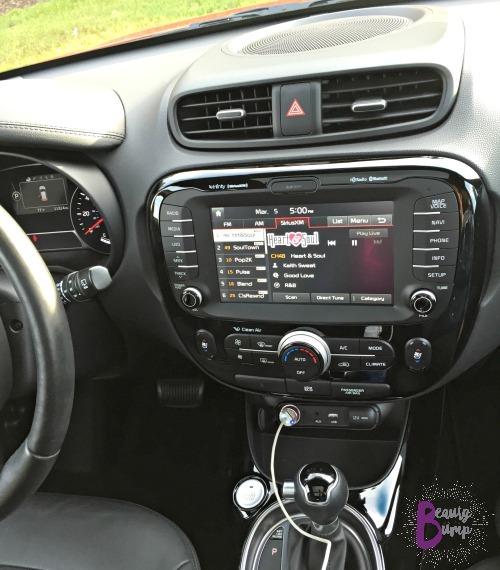 My husband never expected to find an Infinity® sound system inside the Kia Soul ! It seems this surprise was planted there just for him. He loves his music, and he loved the rich, dynamic quality that Infinity® is known for. The 8-inch screen of the center console is the center of attention. It is both eye catching and easy to use. The size of the screen makes it easy to read and the navigation gives detailed turn-by-turn instructions. Plus, there is no lag in the touch screen’s responsiveness to the commands it is given. Did I mention that we were in Florida? The Sunshine State? I’ve never been a convertible person, but a panoramic roof with a gaping sunroof that lets the sunshine and fresh air in is my kind of thing. It may not be a necessity in Florida, but it is in the Northeast so I enjoy having this regardless of locale. I’ll always take a heated steering wheel over not having one at all. And, guess what? Yes, we were in Florida and yes, I used it! For this next one, it bears repeating that the Kia Soul ! is the subcompact car that is big on surprises! 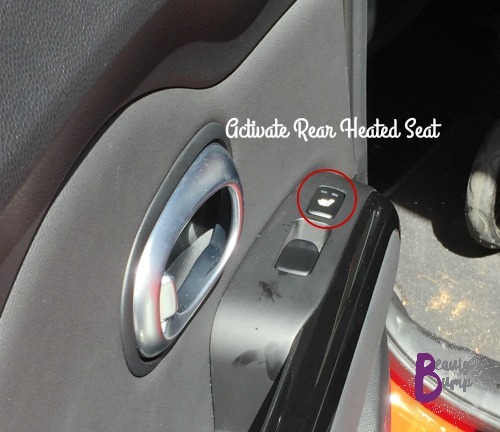 “The Whole Shabang Package” includes Heated Front AND Heated Rear Seats. Surprise! Surprise! Surprise! I am impressed that a car at this price point comes with rear heated seats too. My mother was certainly thankful. This is a woman who left the 30-degree temps of New York City, travelled to the 70-degree temps of Florida, but refused to shed her thermal undergarments. She proudly confessed to rocking her long johns throughout our trip. Yup, that’s my mother .:sigh:. If there’s anyone who has ever appreciated the Kia Soul’s ! rear heated seats it is her.God bless her. The third surprise really comes as no surprise at all. The 2015 Kia Soul ! is easy on the pockets at the gas pump. We covered a fair amount of ground during our five day Florida stay and we stopped at the pump only three times; twice to fill up the 14.2 gallon tank and once to add about four or so gallons. From Orlando we zipped over to the Treasure Coast where we made stops at the Sailfish Brewing Company and Uncle Carlo’s Gelato. We continued south to the Morikami Museum and Japanese Gardens in Del Ray Beach. From there we returned to Orlando and Legoland in Central Florida. In all we tallied 700 miles. We put the listed EPA miles per gallon [City (24)/Highway (31)/Combined (27), respectively] to the test and spent no more than $50 in total at the pump. I’ll return to the beginning for the ending of this post by repeating that the Kia Soul ! is big on surprises! I came into this trip to Florida thinking that I needed a larger car to accommodate my family and me. After all, back home in in New York I am used to routinely driving cars in a larger class that presumably offer more cabin room and comfort than the Kia Soul ! However, I came away from this experience marveling at and appreciating the Kia Soul’s ! 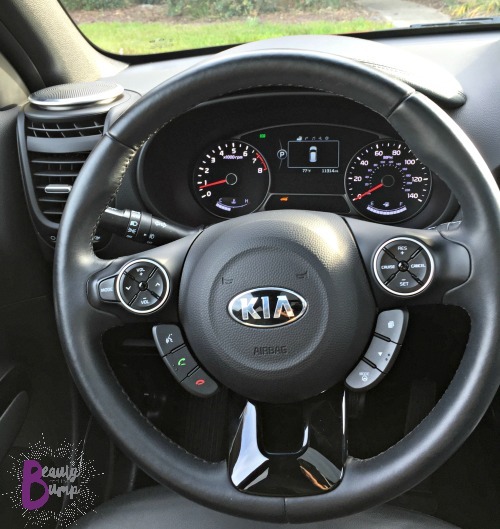 prominent style and features both inside and out, comfort, space, and value; all of which lead me to my final and bonus surprise about the Kia Soul ! it. From the second day of our vacation to the last, spotting and counting Kia Souls ! became our on-the-road game. We pointed out 106 Kia Souls ! by our fifth and final day. People really like this car, and now, so do I.
Judging this book now from my own experience having driven it and from the numbers I saw with my own eyes, the Kia Soul ! is exceptional from cover to cover. Go ahead and see for yourself. 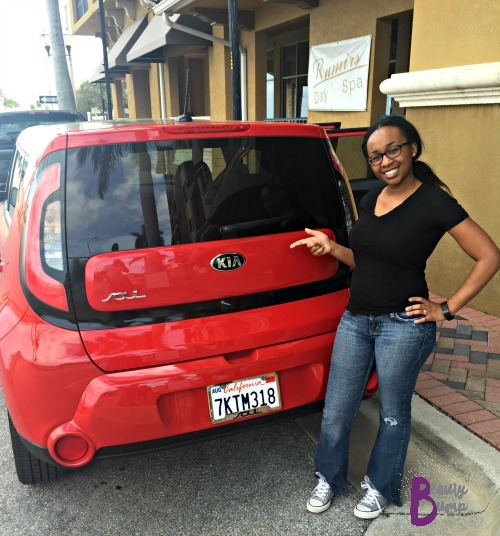 This 2015 Kia Soul ! in Inferno Red with “The Whole Shabang Package”, “Sun & Sound Package”, and carpeted floor mats has an MSRP of $26,835. 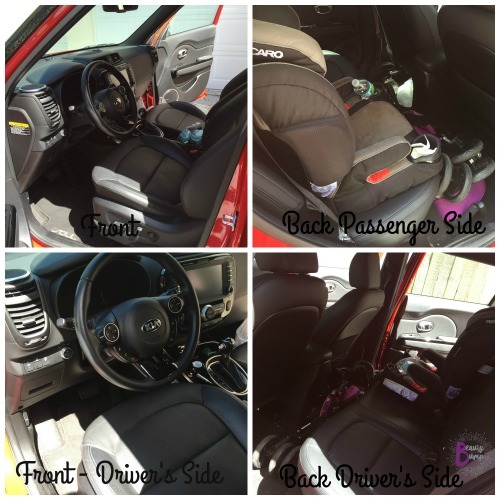 Read more about the 2015 Kia Soul ! here. 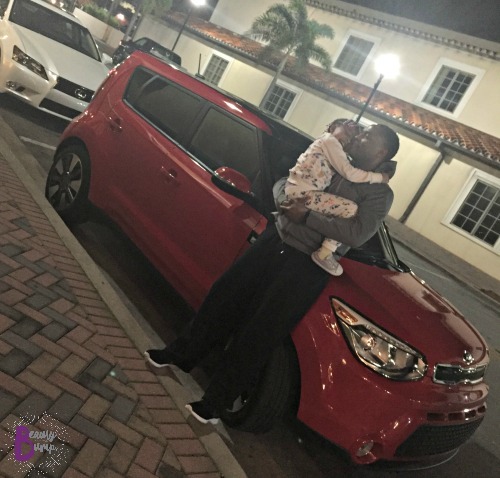 Disclosure: DriveShop provided the 2015 Kia Soul ! to test drive for five days for review purposes only. All opinions are my own and are honest.